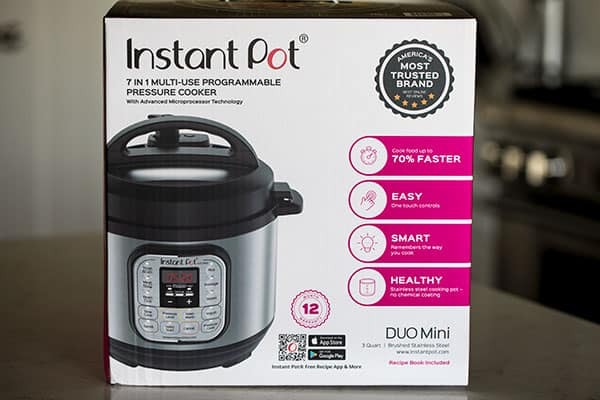 The Instant Pot Company recently released an adorable little 3 quart pressure cooker, and they sent me the Instant Pot Mini to review! 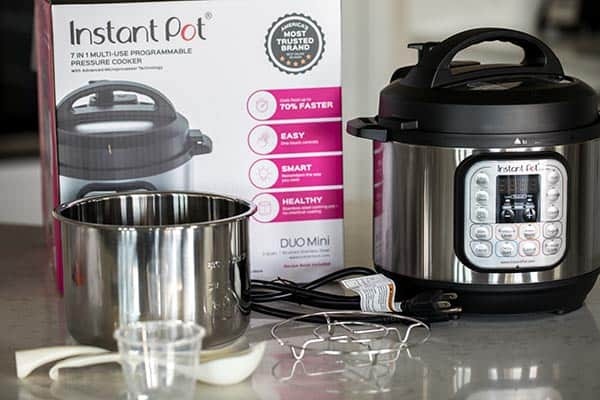 The new Instant Pot Duo Mini is perfect for small families, college students and traveling. The new little 3 quart pressure cooker, officially a Instant Pot Duo Mini 3 Qt 7-in-1 Multi- Use Programmable Pressure Cooker, arrived at my door a few weeks ago. It’s been on my counter ever since. The Mini is such a cute little size, but it can do almost everything the bigger 6 quart Duo can do. It doesn’t have some of the pre-set buttons the bigger Duo has, but if you’re like me, you rarely use the multigrain, sterilize, cake, and egg buttons. All those things can be done / cooked using the Pressure Cook button. I couldn’t agree more. It’s great for all those uses and much of your everyday cooking. But if you want to cook a whole chicken, a big pot of soup, or are having company for dinner, the mini would be too small. 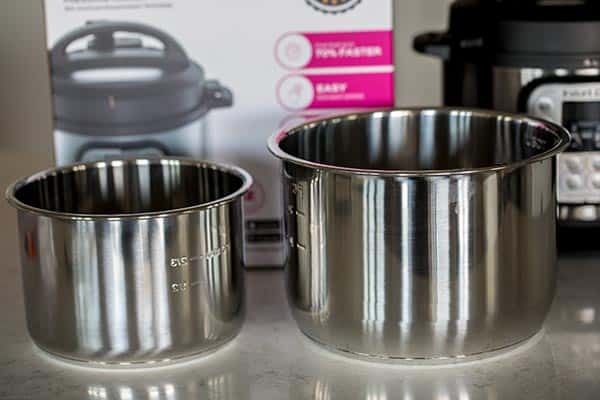 Above is a comparison photo of the Mini cooking pot on the left and the Duo Plus cooking pot on the right. The Mini was the perfect size for most of my needs. I used it to cook my breakfast farro several mornings, rice for dinner several nights, and corn on the cob for lunch one day. I used the same time I would have used with my 6 quart, and all recipes came out perfectly. The Mini comes with a cute little rack, a rice cup, a rice paddle and a soup spoon. My daughter especially likes the rice paddle for stirring and serving rice. The blog Two Sleevers did a review and fun video about the new Mini if your interested in learning more about the capacity of the Mini. The design of the sealing ring on the Mini is a little bit different due to the size and smaller curvature of the lid. The new sealing ring provides for better flow of the steam for the small sized Mini. There’s a little button on the rim of the Mini that pushes down when the lid closes. I understand this is a safety mechanism on the 8 quart Duo as well. If you have limited space, the Mini is a great option. 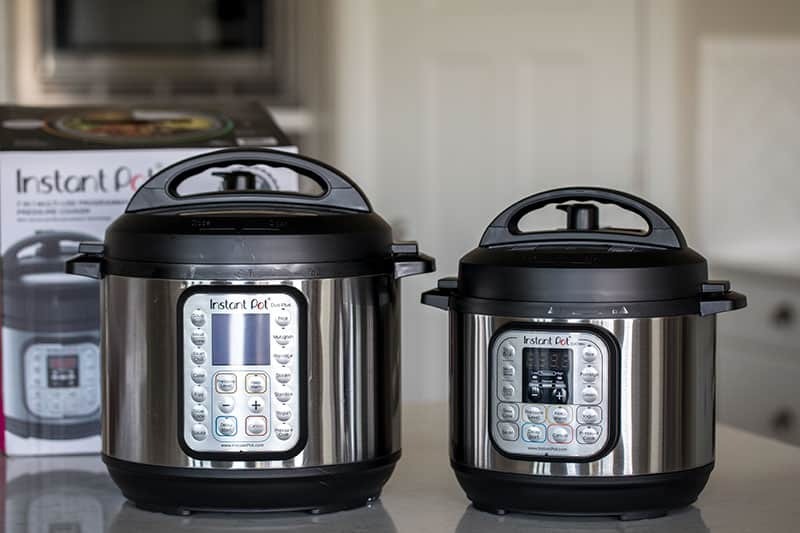 Also, the lower cost of the Mini makes it a more affordable option for gift giving or adding that second pressure cooker you’ve been wanting. I know I’ve loved having it. 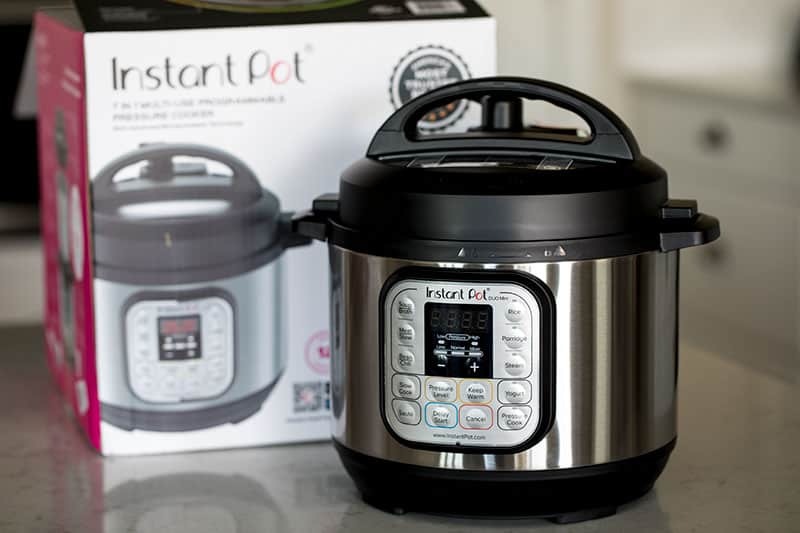 Disclosure: I was sent an Instant Pot Duo Mini to review, but all opinions expressed are always my own. My good friends gave me a Mini Duo for my birthday in October, and I use it many times a week. They asked me what size I wanted, and as I have very little counter space, am single and prefer not to have vast quantities of leftovers, I requested the small size. I love the all-in-one aspect of this, as I hate cleanup, and this makes it so easy! It’s big enough to make 2 portions of whatever I’m cooking, which is perfect. Love the set-it-and-forget-it aspect, no more burnt pot bottoms because I forgot I had something on the stove. Some of the things (like steel cut oats) aren’t necessarily faster, but no stirring required! I eat a lot of soup and it’s great to be able to whip something up in 10 -15 minutes cooking time. This is now on my list of the 2 small electric kitchen gadgets I’d keep when the apocalypse comes (assuming we still have electricity – the other is my Vitamix). Thanks Debbie – you summed up the reasons to buy a Mini perfectly! I find your site informative and to the point. Thanks! 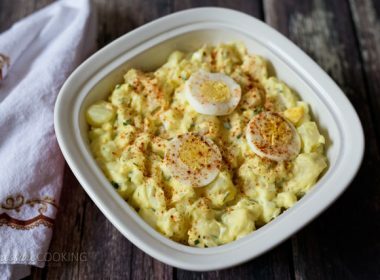 How do I know if the recipe will work in the 3qt mini or if it needs the 6 qt? 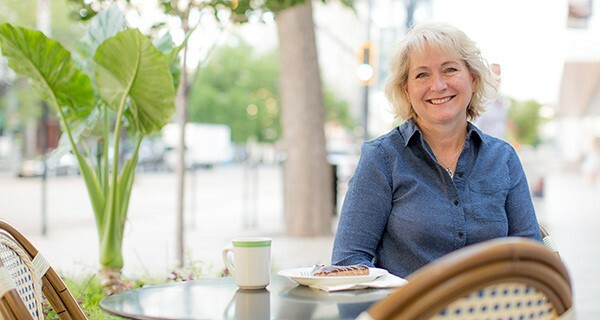 Hi Rhonda – as long as your pot isn’t more than 2/3’s full (half full with things that foam like pasta or oats) then it will work in the Mini. 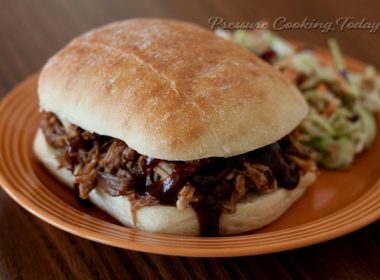 Can recipes specifically for the instant pot mini 3 quart be made in the 6 quart? I don’t have room for another instant pot and thought I may have to adjust the liquid to create steam and the 6 quart unit is 1000 watts which may not take as much time to make. Hi Rita – it depends on the recipe. If it has enough liquid to come to pressure, you can make a 3 quart recipe in a 6 quart – although I haven’t seen many recipes specifically for the 3 quart. Generally recipes are developed for the 6 quart. I wouldn’t worry too much about changing the time because of the watts, most recipes the small amount of difference on timing isn’t critical. I bought a 6 qt instant pot and realized that it’s really to big for me, it’s heavy and I don’t have room in my small kitchen. Then I bought a 3 quart and realized that there’s no setting for poultry or multi grains. I cook both frequently. Now what to do?? Send both back? Hi Nancy – keep the Mini if it’s the perfect size. 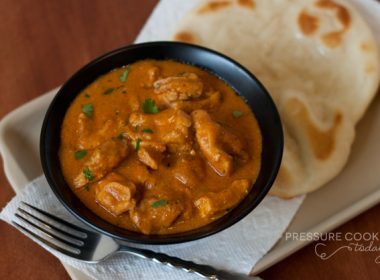 You can use the Manual / Pressure Cooker button for nearly everything including poultry and multi grains. Have fun! Could you tell me the dimensions inside the inner liner, please? My mom just got a 3 qt. and I would like to take some freezer meals next time I visit her. 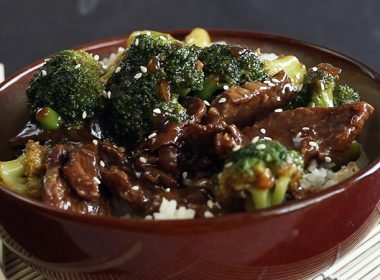 I want to find a container to freeze them in that would allow the meals to be dropped right into the instant pot. I recently bought the 3qt mini (7 in-one Duo Mini) and have tried 2 recipes so far, a steel cut oats one and last night a hunter chicken one, both turned out great…though I had a lot of liquid left in the latter. Followed the recipe, but it turned out ok when I put it on saute and reduced the liquid, adding some tomato paste to the saucey mix. It called for leaving skin on chicken thighs for flavour I guess, but I had to fish out the skins…yuk! Anyway, my question is about the silicone sealing ring. I have tried to find the answer online to no avail. The ring for the 3 qt mini is different looking than the larger sizes. I noted there are different cut-outs on the edge with the mini. I found a post on Reddit that showed a picture and same question, but no one really had an answer. So what is the weird cut out which is sort of rectangular with a kind of ‘uvula’ in the middle? What is it for, because all of the stuff online seems to say it doesn’t matter how you align the ring when you put it back in? It was putting it in after washing it that got me thinking! It must have a purpose, or why have it there? Just wondering, as don’t want to put it in wrong. Any help appreciated, thanks! Hi Noelle – glad you having fun with your new Mini. The design of the sealing ring on the Mini is a little bit different due to the size and smaller curvature of the lid. The new sealing ring provides for better flow of the steam for the small sized Mini. There is no certain alignment for the ring. 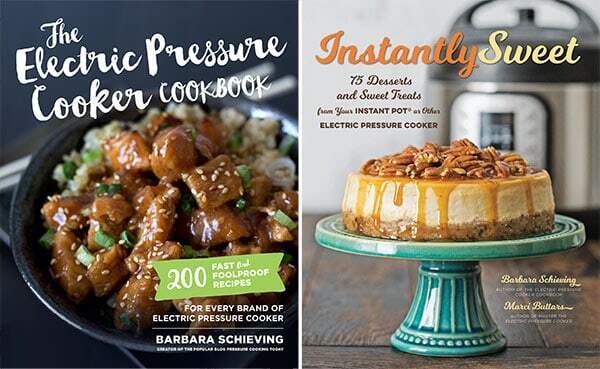 I found this wonderful cookbook at the library “cooking with your instant pot mini “. By Heather Schlueter. Fantastic recipes inside!! 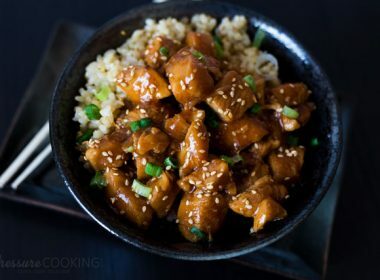 My question….can I make these recipes in my 6 qt pot? Do I double the recipes? I believe the cook time stay the same? Hi Nancy – yes, for most recipes you should be able to double the recipes without increasing the cook time unless the meat is twice as thick.